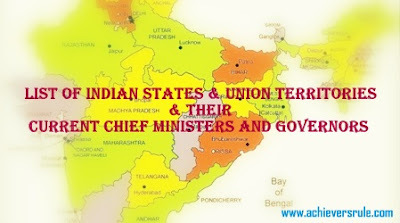 Here is the Complete Lists of Indian States and Union Territories and their Current Chief Ministers and Governors from which questions was generally asked in various Competitive Exams (i.e. SSC CGL, IBPS, RRB etc.). Go through this material. If you need this in PDF form just give us your valuable comments. This material is very essential for all Upcoming Competitive Exams. Go through it Properly. We will release PDF on this topic very soon.